TECHknitting: Joining circular knitting--the 3-in-1 TECHjoin! Joining the first round of casting-on for circular knitting can get ugly. There is a horrid loose stitch where the join occurs, as well as a "jog." The tail gets unwound and makes the loose stitch even looser, while working in the tail has the potential to make a mess of the cast-on edge. 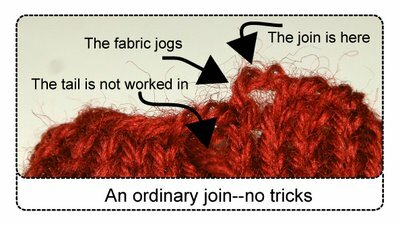 Here is a join for circular knitting which avoids that horrid loose stitch, eliminates that nasty little "jog" AND works in your tail, three tricks in one! 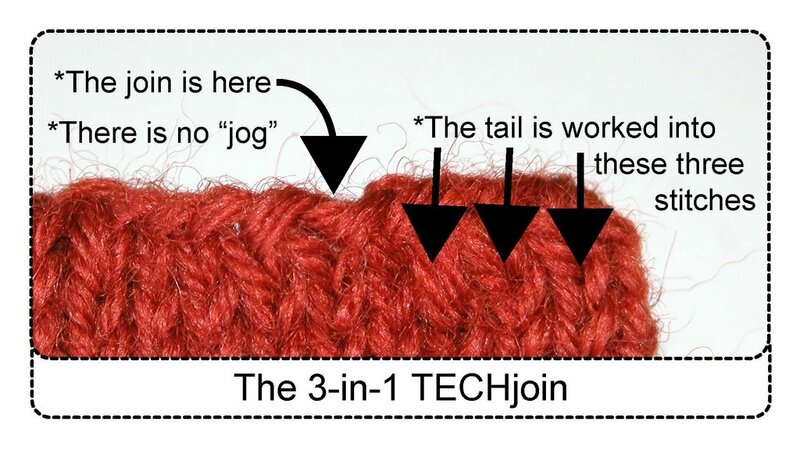 Here is the TECHknitting 3-in-1 TECHjoin! 1. Begin with long-tail casting-on. Long-tail casting on actually consists of a foundation row AND a knitted first row. This double row is substantial and so is easier to keep "sunny side up" when joining. Make the first stitch as a simple loop over one needle, not two. After you've created the first three stitches, create additional cast-on stitches by looping over two needles until you have TWO LESS stitches than you need, total. Create the next two cast-on stitches over only one needle. ADD AN ADDITIONAL stitch, again casting on over only one needle. In the photo above, the first stitch cast on (extreme right) is made by a simple loop. There are 23 stitches cast on, for a 22 stitch tube. Make sure that the stitches are "sunny side up" (not twisted). Pull out one needle so all the stitches lie on one needle. (For dpn's, distribute evenly among 3 or 4 needles.) Arrange your work so the cast-on stitches to knit first lie on your LEFT needle. Slip the first stitch (the one you made by the simple loop method) from the left needle to the right needle WITHOUT knitting it. Starting with the second stitch, knit all the way around. When you come to the end, knit the last stitch together with that first slipped stitch (in knitting parlance, knit 2 together, abbreviated k2tog). SLIP THE NEXT STITCH (which was the second stitch you created, and the first stitch you knitted). OPTIONAL: If you want to mark the beginning of the round, insert a stitch marker after this most recently slipped stitch. Catch the tail yarn and hold it together with the standing yarn (standing yarn=the yarn coming from the ball). Knit the next three stitches with BOTH yarns, then drop the tail yarn and continue with the ball yarn. Ta da! The right number of stitches, no loose join, no jog, and the tail end is already "worked in." A real 3-in-1 trick! Are you nervous about trimming off the tail end? Wait until after you've washed and blocked the garment. This helps the tail felt into the fabric a bit more. 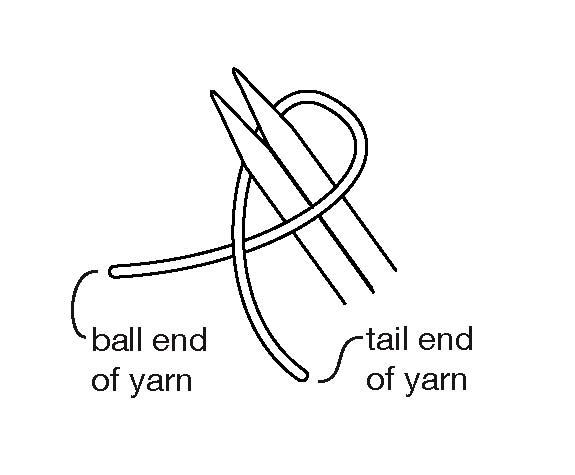 For non-felting yarn, such as superwash wool or acrylic, consider working the tail in even further by picking it up on the second round and knitting it together with the standing yarn for an additional three stitches as you come past it on round 2.